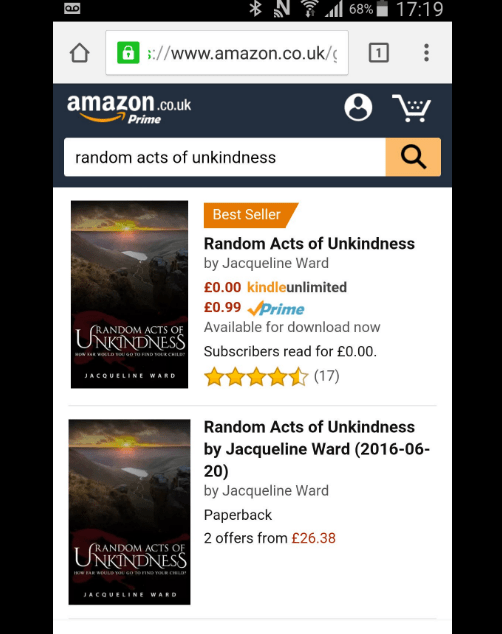 My publisher, Kindle Press, have recently promoted my novel Random Acts of Unkindness on the Kindle UK Monthly Deal for August. Six weeks after the initial publication burst of sales, this promotion has pushed it up the UK rankings from around 15k to 1k with a little help from FaceBook advertising.. While this far exceeded my expectations, I found out mid August that there would be a UK BookBub promotion today, 24th August. 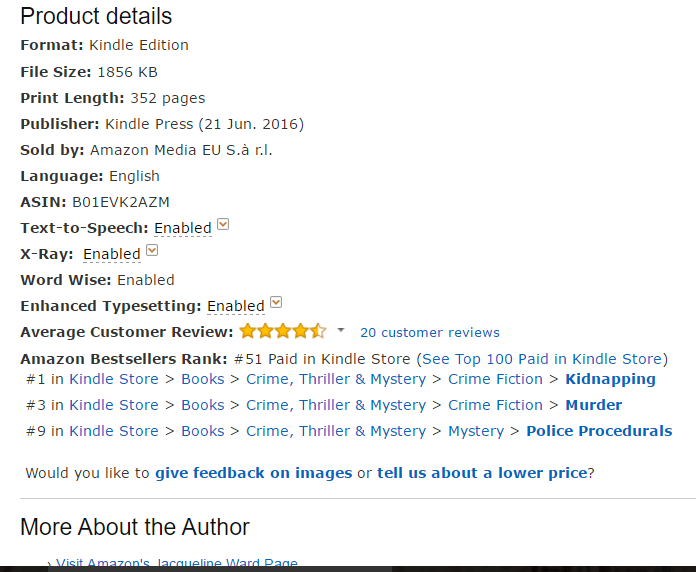 Last Friday, 19th August, I suspect there was another day-long promotion as Random Acts of Unkindness stormed the Amazon UK charts, peaking at #85 and gaining a Bestseller flag for #1 in crime fiction kidnapping. By 11am this morning it has dropped to #693. 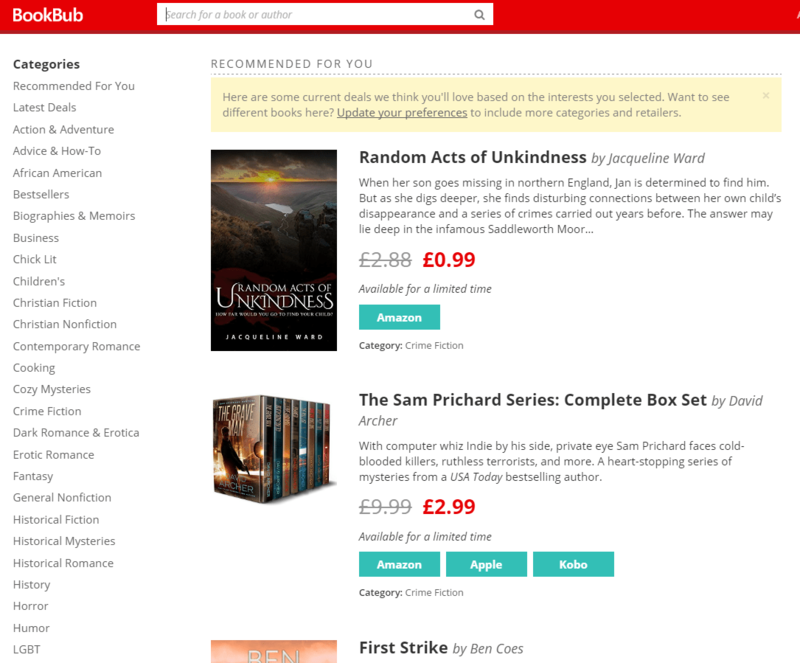 I’ll be updating this blog today to chart the effects of a UK BookBub, then analysing the importance of visibility. 13 00 Random Acts of Unkindness is live on the BookBub site. 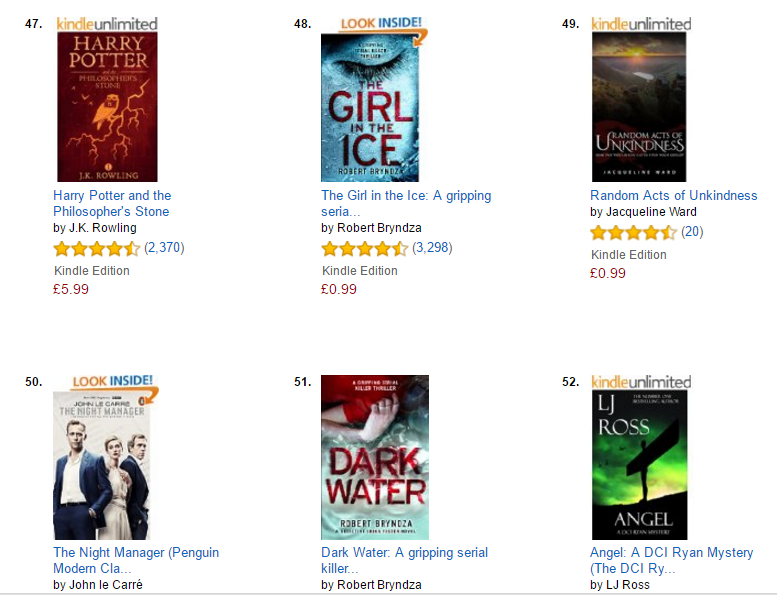 Amazon UK rank #716. 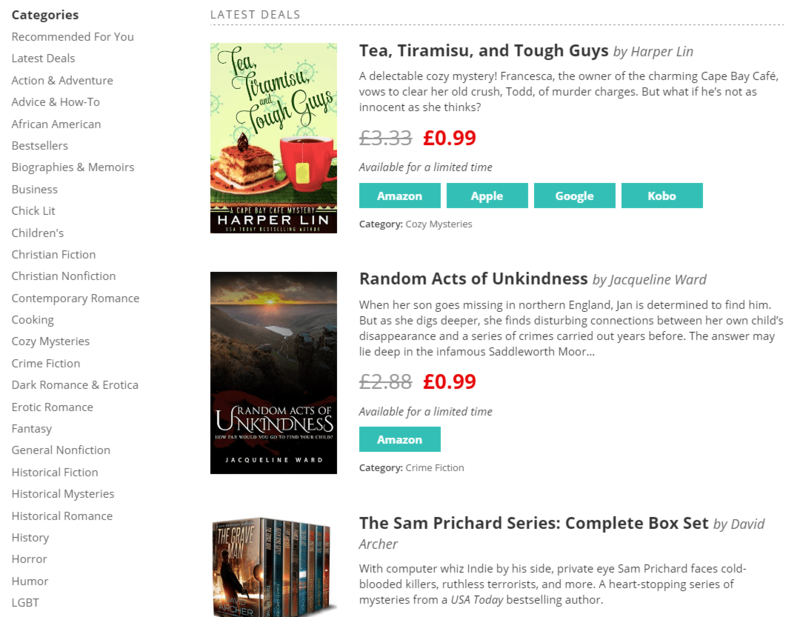 It’s the first on the ‘Recommended for you: Crime fiction’ and second on the ‘Latest Deal’ page so good visibility. 1400 #719 no real movement as yet. 1500 #719 but one ‘review’ by someone who admitted they had not read the book. 1600 #747 Several people on FaceBook told me that they have received the BookBub email. 2100 #143! #2 in crime fiction kidnapping. 4 replies to the review – quite a debate is starting. 2300 #113 – I have to sleep! 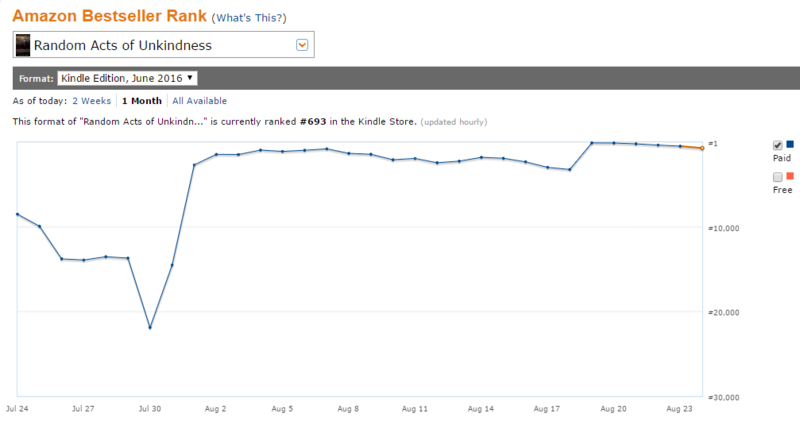 0600 #51 and I woke up to a bestseller flag, This is the highest Random Acts of Unkindness has been in the UK charts. 0700 #49 and next door but one to Harry Potter! A top 50 novel on Amazon! At this point I started to take screenshots and post on social networking. Two days later the rank has fallen to #170 which is still fantastic. It’s also stayed between #8k and #10k rank in the US charts. It’s difficult to say how many books it took to reach the dizzy heights of the Amazon top 50 as Novelrank is based on a predictive model and not reliable when sales speed up, but Novelrank is registering more than 100 books per day in the UK. 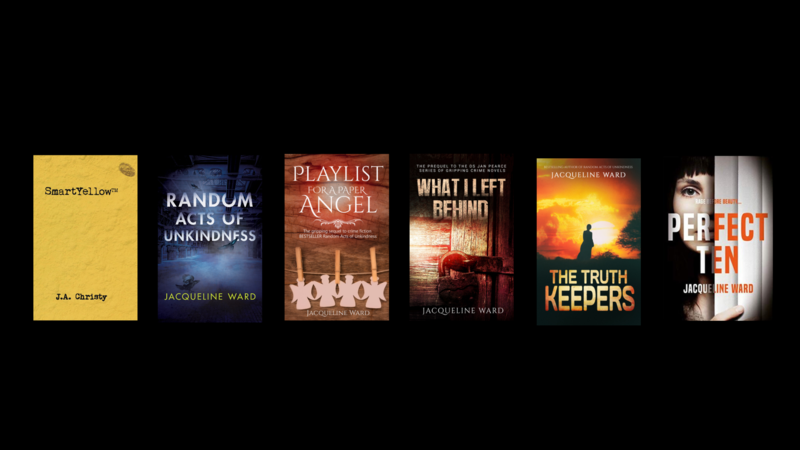 Following the UK BookBub and the UK Kindle Monthly Deal, which produced brilliant sales for August, Kindle Press have just told me that Random Acts of Unkindness will be in a similar US month long promotion in September. I’ll report back on that at the end of September and then evaluate promotions and visibility in Part Three of this blog series in October. Many thanks to my publisher Kindle Press for arranging these promotions.